Episode 117 debuts on February 28, at 8:00 PM Eastern. Rebroadcasts will take place according to the Crusade Channel programming schedule (note: all times listed are Central time). My topic is The Canonization of Billy Graham. My guest is Charles Coulombe. “Tweet” by Raymond Arroyo — I like the man, but this is really, really bad! And there are too many others to post… ! i have been discussing Billy Graham in a thread on that subject on another forum. Thought I would share one of my postings there to contribute Dr. Robert Klenck M.D. ‘s perspective on Billy Graham and some major Protestant ministers and the “Church growth” movement that is line with Peter Drucker’s “Total Quality Management” business management strategies. This is a forum of “patriots” but mostly Protestants or agnostics. I try to post from traditional Catholic perspective. right upper corner of each posting has posting number. The USCCB , the Novus Ordo Catholic US Bishops issued glowing memorial about this heretic and false teacher. If anyone wants a deeper understanding of what Billy Graham and his ilk accomplished for the Protestant Churches, from a Protestant perspective , this lengthy talk by Dr. Robert Klenck, orthopaedic surgeon, spells it out plain and clear. This lecture pretty much sums up a large portion of the deceptions in the biblical christian church from new age ideology to false prophets like Rick Warren, Billy Graham and his friends in the ecumenical emerging church. Here are the places on the video track where Billy Graham clips are shown, of the Dr. Bob Klenck, M.D. video I posted earlier in this thread. Dr. Klenck has wrong understanding about Israel and Zionism in the last days too as are 99 percent of Protestants and “Catholics” today, but Dr. Klenck’s main ideas as related to basic bible teaching are solid. All but two of these places on the track are Billy Graham in a 2003 interview on TV by David Frost. The other two are Billy Graham apparently a visiting person interviewed at Robert Schuller’s Crystal Cathedral church in California probably in early 2000s too. One World Death and Slavery System for ALL. That is NOT what Jesus came to this world for and NOT what His teachings are about. Saint Pope Pius X kicked out of parishes and seminaries ANY and all Persons who even hinted at adopting and teaching the heresy of Modernism) Pope Pius XII immediately made Pope Pius X a saint but that, in the late 1950s, was the last of true popes and true canonizations. There is some evidence, but always sketchy for verifying this subject, that either or both Robert Schuler and Billy Graham were 33 degree Freemasons. 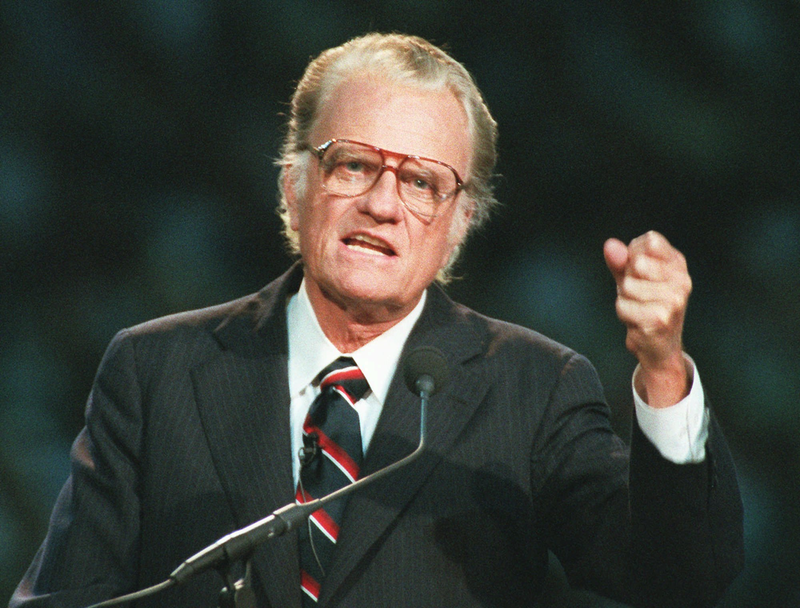 Billy Graham spoke on moral issues e.g., Modesty, with more clarity than 90% of Catholic clergy I have encountered in my 13 years as a confirmed Catholic. Disappointing bc listening to Graham on these issues exposes the soul (hungry for clarity) to doctrinal heresy. Thank you for very fine show. I think the evolution of Billy Graham’s version of evangelization and “the gospel” parallels what happened to the traditional Roman Catholic Church leading up to the Vatican II Council. Protestants did not like Billy Graham’s new ecumenism which started manifesting in the late 1950s. Traditional Catholics do not like the new “ecumenism” that came out of Vatican II. Here is a link to a free 3 hour audio of Bishop Donald Sanborn and others discussing the 6 major documents of Vatican II and how those documents was great change and great change and great destruction of traditional Catholicism. That is the first part of the audio, the first of the six documents covered in the three hour broadcast. Which of the Vatican II documents have the most blatant examples of deviation from the Catholic Faith? Stephen Heiner: So the one we just did?